Edited by Allan T. Grohe, Jr.
d20 Conversion by Merric Blackman. Art by Stefan Poag, Bill Taylor, Dave Zenz. The Eight Kings have fooled the people of Ersille. Not only did King Ovar rule, he ruled eight times over (give or take a court wizard), created anew each day by the Wizard Zayene. He was a complacent king, but set upon evil ways, for his (or was it their?) minds were controlled. You see, the real King Ovar was taken prisoner by Zayene some time ago. And now, instead of wanting Ovar dead, the good people of the Kingdom want the old codger saved! What's a regent to do? This adventure fully describes a wizard's dimension wherein the assassins turned saviors must adventure to rescue good King Ovar! 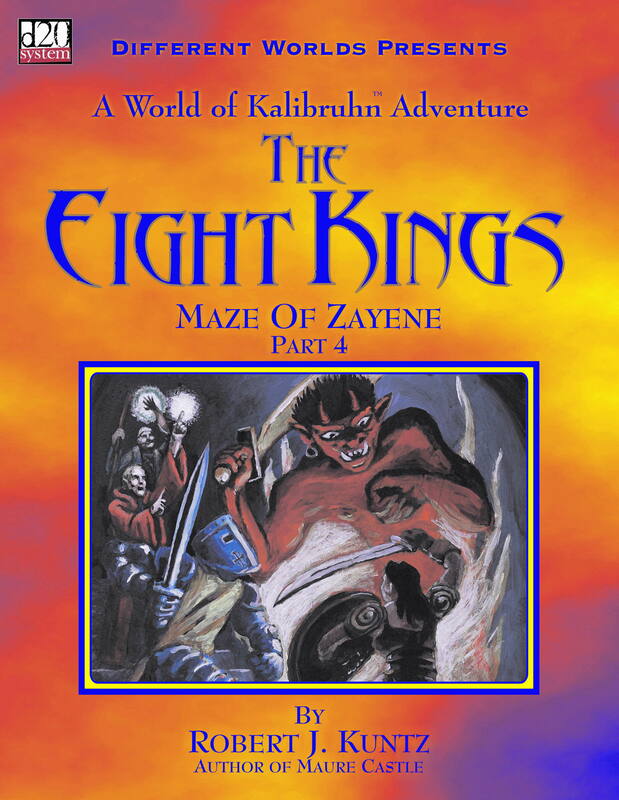 Click here for reviews of Eight Kings. Click here for the link to Robert J. Kuntz's webpage. Maze of Zayene - Part 3: Tower Chaos is available from Necromancer Games.